Hove MP Peter Kyle asked the rail minister why his constituents were getting less compensation for train delays than those in Brighton. As a result of disruption on Thameslink services since the launch of the new timetable in May, rail operator Govia Thameslink (GTR) agreed to give passengers compensation. But Brighton and Preston Park passengers are listed as ‘Level 1’ and get a higher form of compensation than ‘Level 2’ passengers which include Hove and Portslade. Level 1 passengers receive up to one month’s compensation, whereas Level 2 passengers are eligible for just one week’s compensation. During a debate in Parliament on Tuesday (July 24), Peter Kyle called on rail minister Jo Johnson to ensure Hove passengers get fair compensation for the severe disruption they have suffered since the May timetable changes. 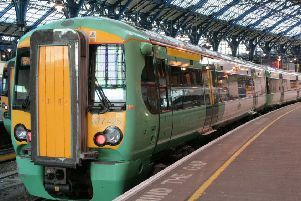 He said: “Under the scheme announced by the Government, passengers travelling from Brighton receive level 1 compensation, but those leaving from Hove receive level 2 compensation. Mr Johnson said: “The hon. Gentleman has been a strong voice for his constituents in recent weeks – I have had almost as many conversations and meetings with him as I have had with the hon. Member for Brighton Pavilion [Green MP Caroline Lucas]. “It is obviously important that the Government focus on compensating first those passengers who have suffered the most disruption. That is the approach we took to the disruption of Southern services a year and a half ago, and we are taking a similar approach now. “That means we have created two categories of passenger. Category 1 passengers are those with a very heavy dependence on Thameslink or Great Northern services from their station. “Passengers with a lesser dependence ​on those operators receive a lower level of compensation, reflecting the fact that they have an alternative means of getting to or from work, primarily. That explains the different approaches to passengers travelling from Preston Park and those travelling from the station the hon. Gentleman mentioned in his constituency.